Memorial service tips and memorial service ideas where loved ones can express their condolences. I found that planning a memorial service is extremely time consuming, emotionally taxing and requires a great deal of organization. That's why I thought of sharing these memorial service tips that will simplify the process for you. I found the strength in making mom's service something she would make her proud. This didn't come easy but luckily my closest girl friends stepped in and offered their help. I know the information below can help you mentally get the ball rolling. Memorial Service Tips Start below! 1. Where should you have it? We had my mom's memorial service at her college chapel at University of Portland. It was lovely and there was a reception location we used just steps away. Think of a place that meant something to the deceased. It could be their church, a beautiful park in the area or at someone's house. Usually a service takes place before the funeral and it is part of the process so loved ones can express their condolences to the family. My mom and I were big fans of white flowers, so I envisioned my mom's memorial service altar with gorgeous white arrangements and a few pieces of her art on easels. I enlisted my grade school best friends to hit the flower mart and pick up white lilies, casablancas and tuberoses. 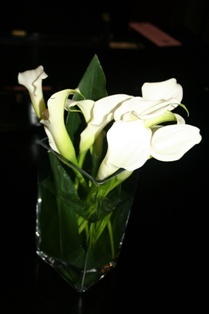 They also bought simple vases for the alter flowers and a vase for each table at the reception. We used my friends garage and put the arrangements together over a glass of wine. This avenue helped keep the price down, and the experience was bonding and healing, and I needed as much support that I could ask for. Ask for support if its not offered, You will find that friends and family want to help...they just have a hard time knowing how to help. They need your guidance to tell them what to do. 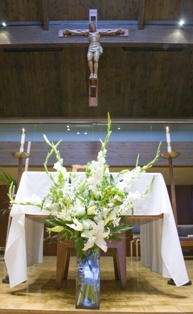 Another memorial service idea is to decorate the alter with the flowers that are sent for the memorial service by friends, family and loved ones. 3. Set up a scholarship in lieu of flowers. Art was one of my mom's passions, we set up an art scholarship at the University of Portland in her name. As of today, there is over $7,500 in the scholarship fund! It is nice to give to someone who needs the help and this gift will surely have an effect on someone's life forever. How great is that?! When your loved ones send Flowers to express their condolences these flowers although very beautiful, tend to only last a few days. A scholarship is the gift that keeps on giving. Just keep in mind, whatever you think would work best for your family is the right decision. There is never a wrong decision in honoring someone's life. 4. Speakers at the service? Selecting a family member of the deceased or one or two of their inner circle of friends is always a good choice. This will add a different and unique perspective of the deceased. It is also good to note people enjoy hearing stories of the deceased. Of course, some people are not comfortable speaking, so have them people read an excerpt from the bible or a poem. This is a way for them to stay in their comfort zone. If someone you ask turns you down, don't be upset. Everyone does the best they can under the circumstances. Exit memorial service tips and check out Writing a eulogy for tips and examples. We used a few pictures of my mom and her art. We had everything printed at Kinkos, and they did a nice job. Make sure the pictures you use are high quality. Low image quality makes the pictures print blurry. Add a paragraph or two about the deceased, the date of their passing, who the speakers are and where they can donate for the scholarship. You can truly customize the handout to your liking. You can add a poem or bible reading if you choose to. 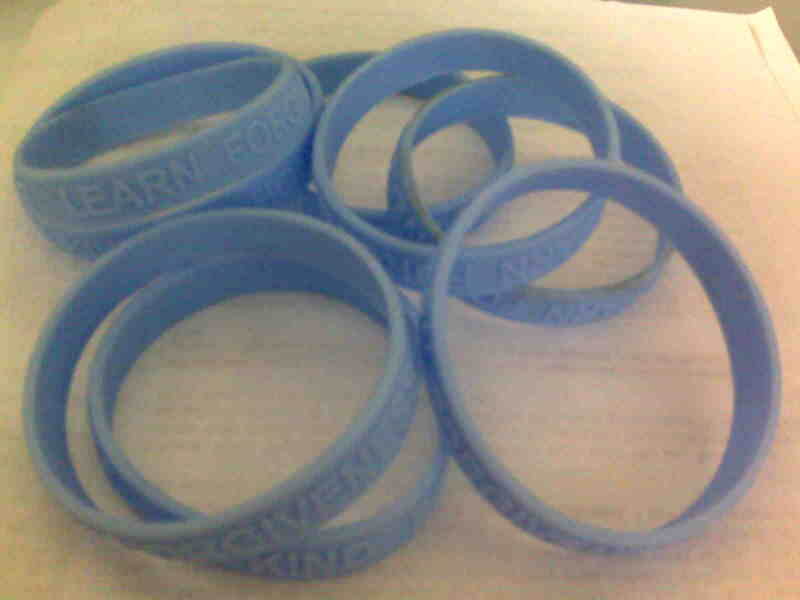 We decided to make up "Lance Armstrong" type of bracelets to hand out at the service. We printed her motto "Be honest, be kind, and learn forgiveness" and made them in my mother's favorite color. This was a hit and everyone was wearing the bracelet. My dad, brother and I wear these to this day. P.S. These also were included in the thank you cards we sent to the folks who could not attend the memorial service, but did go out of their way to show their support. Just remember to send thank you cards to everyone who reached out to you through cards or flowers. Visit funeral thank you notes for examples. Are their and memorial service tips or any memorial service ideas that I am missing that you would like to share? Contact me and let me know. I would love that. We enlisted the help of a professional who edited and placed all the pictures we provided in a beautiful montage of my mother's life. 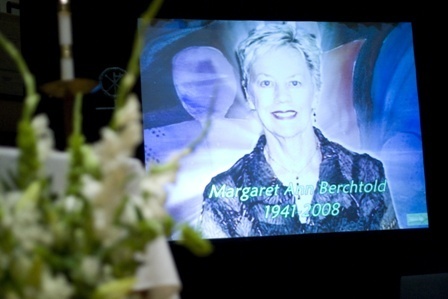 Memorial videos are very affective in reflecting on their life and the person they were.